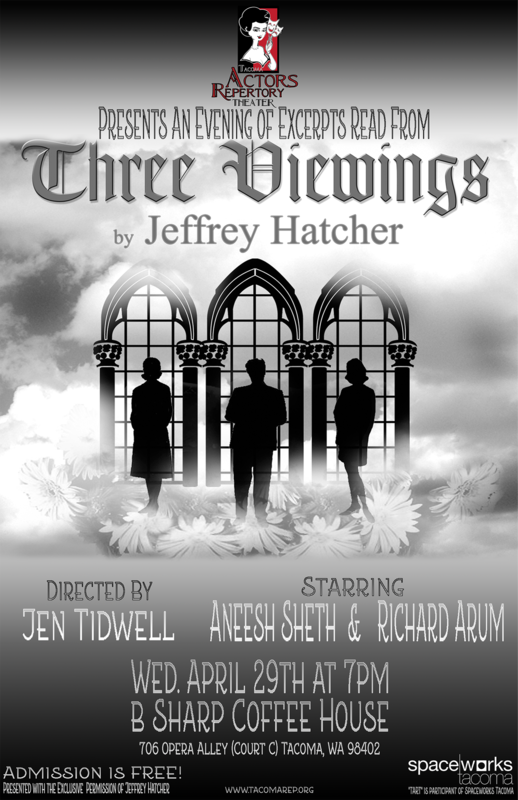 Tacoma Actors Repertory Theater (TART), Tacoma’s new professional company will present a preview of its premiere show Three Viewings by Jeffrey Hatcher at B Sharp Coffee House on April 29. This first look/sneak peek, directed by TART Artistic Director Jen Tidwell, features actors Aneesh Sheth from NBC’s Outsourced and Gregory Award-nominated actor Richard Arum. The preview performance is free of charge. Admission is free. The reading will be held at B Sharp Coffee House, 706 Court C in downtown Tacoma’s Historic Theatre District at 7 PM on April 29. Visit www.tacomarep.org for more details. Tacoma Actors Repertory Theater is a participant of Spaceworks Tacoma.